The Artwork for the cover of my boo k is by Sergey Nivens. It is a visual of my trademark, Lightrunner ®. My Memoir is currently available for sale through Amazon and Barnes & Noble both in paperback and Kindle or Nook. For those of you who want an autographed copy with a personal message from me, simply click the ‘Buy Now’ link below and click the link below. This would make a great Christmas present for all your book loving friends. Read my 5 star reviews on Amazon and Barnes& Noble. Published by Synclectic Media, Seattle, Washington. Read my 5 Star reviews, with more on Amazon.com and Barnes and Noble. 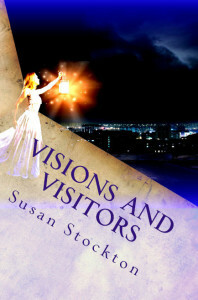 I found “Visions and Visitors” to be a vivid personal memoir of Susan Stockton’s life. She has a keen ability to write in minute detail. Throughout most of this memoir, I felt I was beside her in her many adventures. What a life! It is beyond my life’s experiences to understand the out of body experiences yet, in another way, this all could be believable. It was an adventurous read to say the least. I only put the book down to sleep. Also, being an avid reader I appreciate the excellent type and the nice white pages. It was a comfortable read, as well as an excellent read for the curious mind. We are travelers journeying into a mind and spirit of a light runner/psychic with Visions & Visitors. And what an amazing trip that is mingled with enlightenment, spontaneity finding a path as unique as the author as she spins a story with focus that took her on her personal life’s quest from childhood visions to adulthood readings. Weaving her life history time patterns through the years brings, for some who lived that time, a recall of one’s own life. The author’s experiences pushed her through a myriad of adventurous choices that led her to trust her inner voice, an awakening of self realization into finding her truth. Visions and Visitors is a personal directional and educational guidance filled with love, sightings, humor, sadness and finally…resolution. Turn each page and delve into the author’s mind. You will not be disappointed and perhaps, along the way, “see” things different. It is in the seeing that understanding becomes belief.